Asparagus is a great veggie to make as a finger food. The spears are fun and interesting for baby to look at. Did you know that the asparagus is actually a member of the Lilly family? Asparagus plants will shoot up new asparagus spears for 6-8 weeks during the growing season. Only young asparagus is eaten, as older plants have a tendency to get “woody”. When Can I introduce Asparagus in Baby Food Recipes to my Baby? Asparagus, like broccoli or cauliflower, might not be a good choice for one of baby’s first vegetables. Asparagus may cause gas and may be a bit hard for a tiny tummy to digest. Asparagus is best given to an infant between 8-10 months old. If your baby has had any digestive issues, it would be best to introduce asparagus into the diet later rather than sooner. As with any suggested age recommendation, there is no harm in trying asparagus earlier and many babies have been introduced to it earlier than 8 months of age. Keep in mind that some people find that asparagus gives them a bit of gassiness and bloating; watch for these symptoms when you feed your baby asparagus. Asparagus makes a great Baby Finger Food too. According to the EWG, asparagus is not one of the “dirty dozen” foods most highly contaminated with pesticides – purchasing organic is a personal choice. In most markets, asparagus is sold by the bunch. You should buy a bunch where the asparagus spears are relatively uniform in thickness so that the spears will cook and be done at the same time. If you buy a bunch that has some spindly thin and thick and fat spears, the thin ones will turn mushy while the thicker spears may not even be done! Be sure to inspect the tips of the asparagus. These little “flowers” should be a bit firm and definately not soft and mushy. Asparagus may be found in the colors of green, white and purple. There is really not a lot of difference in the taste so choose any color you fancy! Prep the asparagus by holding one asparagus spear with one hand in the middle of the spear and the other hand at the stem. Bend the spear until it snaps. Toss out the lower end that snapped off. Repeat this process until all of the asparagus is “snapped”. A few people do recommend peeling asparagus – I have done this only once and found it very very time consuming and quite frankly, not worth the trouble. The snapping method works just fine. You may however wish to experiment with both methods. Saucepan or Steamer: Cook fresh asparagus in a small amount of boiling water until tender. Fresh asparagus will be crisp-tender in 5 to 8 minutes. Place a strip of folded aluminum on the bottom and up the sides of the pan, extending over the edges. Bring water to a boil; add asparagus spears and cook, uncovered, until crisp-tender, 3 to 5 minutes. Use foil strips to gently lift the spears to a serving dish. Double Boiler or Percolator: To steam asparagus in an upright position, fasten the stalks into a bundle using a band of foil or string. Stand the stalks upright in the double boiler or percolator with the tips extending an inch or more above the boiling, salted water. (A glass cooking vessel works best.) Cover and cook until tender, 5 to 8 minutes. Stir-Fry: Cut spears diagonally in 1/2 inch pieces, leaving tips whole. Stir-fry pieces in butter or hot oil, in a skillet or wok at medium high heat. Stir constantly until tender-crisp, 3 to 5 minutes. Microwave: Fresh Asparagus: – Microwave fresh asparagus by placing one pound in a microwavable baking dish or serving bowl. If cooking whole spears, arrange with tips in center. Add about 1/4 cup water and cover tightly. Microwave at 100% power for 4 to 7 minutes for spears, 3 to 5 minutes for cuts and tips. Stir or turn halfway through cooking time. Frozen Asparagus: – Microwave frozen asparagus in a covered microwavable baking dish with 2 Tablespoons of water. Cook at 100% power for 4 to 7 minutes, stirring or rearranging once. Step 1: Wash asparagus under cool water. Step 2: Place asparagus, “flower” side up into a steamer basket. 3. Steam asparagus until very tender and mushy or baby food puree. Step 3: Puree the asparagus when finished steaming. Place into your choice of appliance for pureeing and begin pureeing. Step 4: Add water as necessary to achieve a smooth, thin consistency. I suggest serving steamed asparagus as a finger food because it’s easy to pick up.. Step 1: Heat oil in a large skillet over medium heat; add onion and sauté until tender. Step 2: Add asparagus, chicken broth, basil and garlic powder; bring to a boil over medium-high heat. Step 1: Trim the fresh asparagus (skip if using frozen) separating the stalks from the flowers. Steam the flowers (tips) separately. Step 3: Add the stock and the potatoes. Reduce the heat to simmer and cover. Simmer for 20 to 25 minutes or until vegetables are tender. Step 4: Puree in food processor until smooth. Add seasonings such as basil, pepper, rosemary (great with pepper and basil.). Step 5: Return the puree to the saucepan and add the asparagus flowers (tips). Step 6: Serve sprinkled with Parmesan cheese. Step 1: Preheat your oven to 425 degrees F (220 degrees C). Prepare a 9×13 inch baking dish with a light coating of olive oil. Step 2: Mix the chicken, onion, and asparagus together then add to the prepared baking dish. Step 3: In a large bowl, beat together the eggs (or egg yolks), milk, flour, parmesan cheese, and the herbs/spices. Pour over this over the chicken/asparagus mix. Step 4: Bake for approx. 20 minutes or until a knife inserted in the center comes out clean. Sprinkle with the cheddar cheese then back into the oven to bake for 3 to 5 minutes, or until cheese is melted. 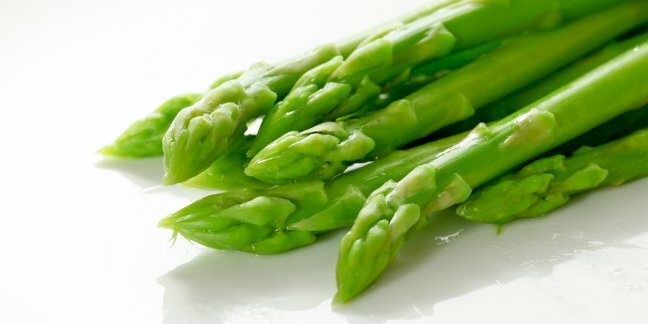 Many babies who eat asparagus will have urine with a very bitter smell and quite possibly color changes due to the asparagus.